She'd run into a cul-de-sac. There was no way out from this end of the cinema, and judging by the come-ons she was giving him, she knew it. She turned and flattened herseif against the wall, feet spread out a little. He was within a couple of yards of her when a breeze out of nowhere billowed her skirt up around her waist. She laughed, half closing her eyes, as the surf of silk rose and exposed her. She was naked underneath. Ricky reached for her again and this time she didn't avoid his touch. The dress billowed up a little higher and he stared, fixated, at the part of Marilyn he had never seen, the fur divide that had been the dream of millions. There was blood there. Not much, a few fingermarks on her inner thighs. The faultless gloss of her flesh was spoiled slightly. Still he stared; and the lips parted a little as she moved her hips, and he realized the glint of wetness in her interior was not the juice of her body, but something else altogether. As her muscles moved the bloody eyes she'd buried in her body shifted, and came to rest on him. She knew by the look on his face that she hadn't hidden them deep enough, but where was a girl with barely a veil of cloth covering her nakedness to hide the fruits of her labour? "You killed him," said Ricky, still looking at the lips, and the eyes that peeked out between. The image was so engrossing, so pristine, it all but cancelled out the horror in his belly. Perversely, his disgust fed his lust instead of killing it. So what if she was a murderer: she was legend. "Love me," she said. "Love me forever." "Looking back, I think Volume I contains the most accessible stories. Volume III contains the more problematic stuff. 'Son Of Celluloid' is a good fun tale, but it's highly weird. 'Human Remains' is also weird, and it's one of my favourite stories, but none of them are impenetrable. Many of the deeper undertones that are reflected in Volumes 4, 5 and 6 are presaged in Volume III, so there's a sense in Volume III that we're moving away from hack 'n' slash into more off-the-wall areas." "The second 3 books, in my absolutely unbiased opinion, are much better than the first 3. Much denser, much richer, much more confident, much more paradoxical, and on one level, much, much more vicious. There's a lot more 'celebration' in the second 3 books. There are stories in these volumes which separate the sheep from the goats, and 'Son of Celluloid' is one of them. There are people who are totally unsympathetic to that particular story. I don't think of 'In the Hills, the Cities' or 'Jacqueline Ess' as strictly a horror story. I mean there are out and out, unapologetic horror stories in there: 'The Midnight Meat Train' and 'Rawhead Rex' and 'Pornographer's Shroud' and so on. But there are stories there which are just... just stories of imagining of one kind or another." "I did a story called 'Son of Celluloid', I guess in the Volume 3 of 'The Books of Blood' which is about a cancer which does movie star impersonations in an old cinema. And it turned on the possibilities, of one point at which this cancer which walks and talks and does Dumbo, Astaire and a great Monroe and a wonderful John Wayne, says I am a dreaming disease, no wonder I love the movies. So I guess that would be the cinematic equivalent [of the quote, 'Everyone's a book of blood; whenever we're opened we're red.'] I guess going to the movies is a dreaming disease, right?" "Absolutely, of course! And isn't that a great book? Extraordinary. 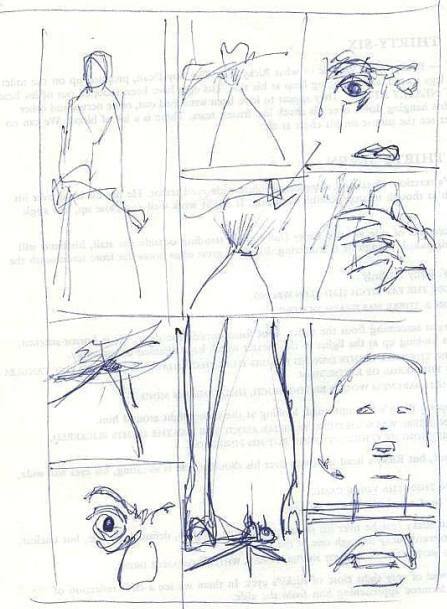 Now I don't think many people in America know about Bataille's work. I mean I assume he's as obscure in America as he is here in England. Most of his stuff isn't even translated." Clive had a three-picture deal with Morgan Creek back in 1988 which was intended to cover an adaptation of Son of Celluloid as well as both Nightbreed and a planned Nightbreed sequel. "Certainly from our company [Film Futures] will come at least one movie based on the new novel Cabal, maybe two, and an adaptation of Son of Celluloid, which will be very outrageous." "I pitched a few of my stories to Columbia Pictures a few years back. They obviously hadn't heard of them but liked the sound of one called Son of Celluloid. 'That's a fun title,' they said, 'what's it about?' And I just said, 'It's about a cancer that does impressions of movie stars...' Their faces hit the floor. Wham! And suddenly I wasn't so welcome in their offices any more." As it turned out, Nightbreed's disappointing box-office reception led to the abandonment of the three-picture deal and Son of Celluloid never made it past screenplay stage. Unconstrained by the sheer cost of filming a movie, the 'comics' adaptations of many of Barker's Books of Blood were more successful. Arcane and Eclipse produced an eventual five volumes of Tapping the Vein, together with standalone adaptations of Rawhead Rex, Dread, The Life of Death, Revelations, Son of Celluloid and The Yattering and Jack - all these appearing in a concerted period between 1989 and 1994. 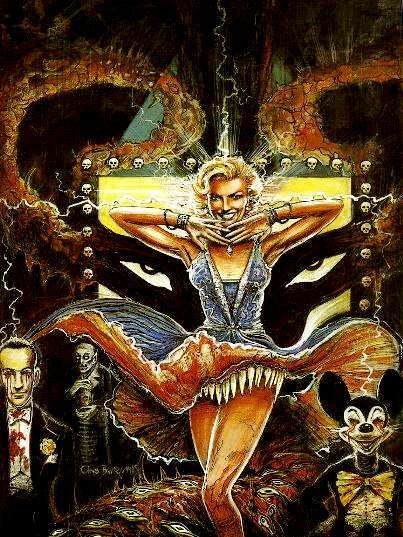 Steve Niles adapted several stories as graphic novels, including Down Satan, New Murders in the Rue Morgue and Revelations (as well as editing the Illustrator coffee table book of Barker's art and overseeing the publication of lithos of the Books of Blood covers) and would extend the successful collaboration that he was to enjoy with English artist Les Edwards on Son of Celluloid with a second joint effort on Rawhead Rex the following year. Shot from behind Monroe as her dress rises, billowing, exposing her fully naked body. Ricky's hand (he is facing us) is on her shoulder but only his fingertips because he is still just a bit too far away. Also his eyes are clearly staring down at her crotch. Caption: Ricky reached for her again and this time she didn't avoid his touch. The dress billowed up a little higher and he couldn't help but stare, fixated, at the part of Marilyn he had never seen, the fur divide that had been the dream of millions. Same exact shot angle, except Monroe's hips are swayed in the other direction, and though Ricky still stares down between her legs, he is no longer smiling and he has lifted his hand slightly off her shoulder. Caption: There was blood there. The faultless gloss of her flesh was spoiled slightly. Caption 2: But still he stared as she moved her hips, and he realized the glint of wetness in her interior was not the juice of her body, but something else altogether. Reaction close up of Ricky staring down, terror back in his wide eyes. Shot of both their feet, Monroe in heels, Ricky in sneakers old and worn. Resting at the base of Monroe's heels, at the end of a trail of blood down her leg are the bloody eyes of the boy Dean. Caption: The bloody eyes she'd buried in her body shifted and fell. Shot including both Monroe and Ricky. They are both looking down now, Ricky in disgust, her in disappointment. Caption: She knew by the look on his face that she hadn't hidden them deep enough, but where was a girl with barely a veil of cloth covering her nakedness to hide the fruits of her labors? Caption 2: Perversely, his disgust fed his lust instead of killing it. Close on Monroe. For the first time she is not smiling, as she looks up wide puppydog-eyed at us, the reader. Caption: So what if she was a murderer: she was legend. MONROE: Love me. Love me forever. Staying with this basic layout, but refining it down to eight panels, Edwards painted the final artwork in acrylics on a 16.5 x 22 inches ivory board. This is shown below with the published version including Steve Niles's captions. "The combination of grim imagery and blatant Technicolor glamour which is so much a part of the original story is very much intact in this rendering. This is a very difficult story to adapt, because it requires a full and thorough knowledge of movie devices as well as comic book devices. I think that the skill with which Les Edwards and Steve Niles have applied those devices is brilliantly on target and immensely entertaining. 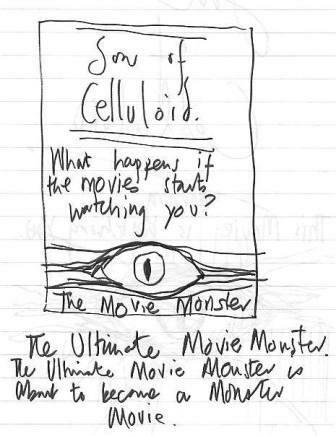 "Son of Celluloid is a wonderful compendium of movie genre quotes and little in-jokes. It's something you want to go back to a second and third time to find the things Les has buried in the frames. The little portraits, asides, and witticisms he's hidden in his paintings make this a rewarding read even on the second or third time." See more original artwork from Son of Celluloid at Les Edwards's site where you can also buy originals and prints of Les's outstanding (and multi-award-winning) work. See more of Steve's Niles's work here including the extraordinary 30 Days of Night. With thanks to Val and Les Edwards.